Biomine: Predicting links between biological entities using network models of heterogeneous database. Lauri MA Eronen and Hannu TT Toivonen. BMC Bioinformatics 13:119, 2012. Public biological databases contain huge amounts of rich data, such as annotated sequences, proteins, domains, and orthology groups, genes and gene expressions, gene and protein interactions, scientific articles, and ontologies. The Biomine project develops methods for the analysis of such collections of data. As a motivating problem, consider gene mapping. Mapping of a disease can result in tens or hundreds of candidate genes. The next problem is then to identify the most promising genes for further research. The current state of the art consists largely of manual exploration of public databases, for instance to find connections between genes and phenotypes. The Biomine project develops methods for automated discovery and prediction of previously unknown and potentially biologically relevant connections. Our focus is on candidate gene analysis, and methods we develop help geneticists assess the potential relationship of their candidate genes to the disease under study. 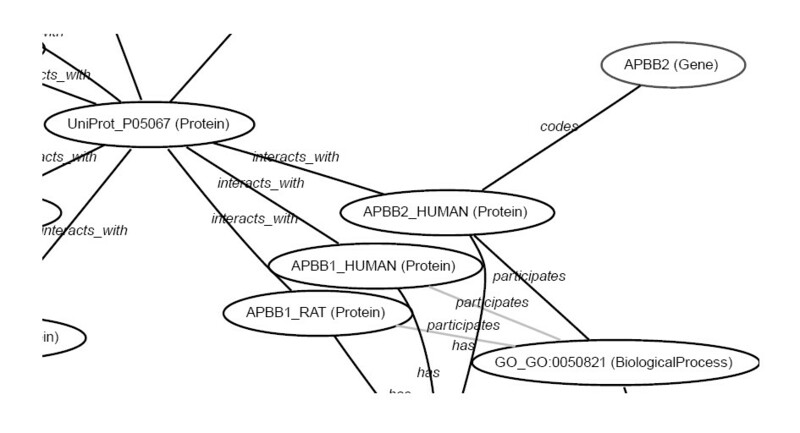 In the Biomine approach, all information is handled as graphs: nodes correspond to different concepts (such as gene, protein, domain, phenotype, biological process, tissue), and semantically labelled edges connect related concepts (e.g., gene BCHE codes protein CHLE, which in turn has the molecular function 'beta-amyloid binding'; see a simple example graph). One central goal is to develop methods for establishing new, previously unknown connections between nodes, in other words, creation of biological hypotheses. We develop and use data mining algorithms for this. Predicted connections could be based, for instance, on discovered analogies between two concepts or their contexts, or on finding (strong) paths between concepts. Discovery of patterns in graphs have numerous potential applications in biology, including the analysis of metabolic networks, regulatory relationships, protein structures, and chemical compounds, as obvious candidates. Virtually any data could be described as graphs, and the developed methods can potentially be applied in other areas, too. Lauri Eronen and Hannu Toivonen. BMC Bioinformatics 13:119, 2012. Vid Podpecan, Nada Lavrac, Igor Mozetic, Petra Kralj Novak, Igor Trajkovski, Laura Langohr, Kimmo Kulovesi, Hannu Toivonen, Marko Petek, Helena Motaln, Kristina Gruden. BMC Bioinformatics 12:416, 2011. Petteri Hintsanen, Hannu Toivonen, and Petteri Sevon. The 2010 International Conference on Advances in Social Networks Analysis and Mining (ASONAM), 104-111, Odense, Denmark, August 2010. Melissa Kasari, Hannu Toivonen, and Petteri Hintsanen. The 14th Pacific-Asia Conference on Knowledge Discovery and Data Mining (PAKDD), Part II, LNAI 6119, 168-177, Hyderabad, India, June 2010. Igor Mozetic, Nada Lavrac, Vid Podpecan, Petra Kralj Novak, Helena Motaln, Marko Petek, Kristina Gruden, Hannu Toivonen, and Kimmo Kulovesi. The 1st International Conference on Computational Creativity (ICCC-X), 190-199, Lisbon, Portugal, January 2010. Petteri Hintsanen, Hannu Toivonen. Data Mining and Knowledge Discovery 17 (1): 3-23. 2008. Luc De Raedt, Kristian Kersting, Angelika Kimmig, Kate Revoredo, Hannu Toivonen. Machine Learning 70 (2-3): 151-168. 2008. Petteri Sevon and Lauri Eronen. Journal of Integrative Bioinformatics 5 (2): 100. 2008. Luc De Raedt, Angelika Kimmig, Hannu Toivonen. 18th European Conference on Machine Learning (ECML), 176-187, Warsaw, Poland, September 2007. Winner of the ECML-07 Best Paper Award. The Most Reliable Subgraph Problem, Petteri Hintsanen. 11th European Conference on Principles and Practice of Knowledge Discovery in Databases (PKDD), 471-478, Warsaw, Poland, September 2007. Luc De Raedt, Angelika Kimmig, Hannu Toivonen. Twentieth International Joint Conference on Artificial Intelligence (IJCAI-07), 2468-2473, Hyderabad, India, January 2007. Petteri Sevon, Lauri Eronen, Petteri Hintsanen, Kimmo Kulovesi, Hannu Toivonen. 3rd International Workshop on Data Integration in the Life Sciences 2006 (DILS'06), LNBI 4705, 35-49, Hinxton, UK, July 2006. Springer. The project is carried by the Discovery Research Group.